Unless you're accustomed to struggling with the wrong size of knife for the fish you happened to catch, you may wish you had the money or the space to carry a full set of fillet knives with you. 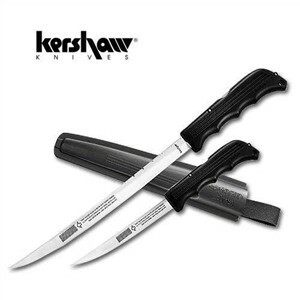 Kershaw makes fixed blade fillet knives from six inches blade length to nine, but they take up a lot of room in the tackle box. Consider Kershaw's Seven Step instead -- their full range of blades and more, in one adjustable knife. With the adjustable Seven Step Fillet Knife, you'll get a narrow and flexible fillet blade of 420J2 high carbon stainless steel, notched to set firmly at half-inch stages from a short 5-1/2 inch cutting edge -- small enough for pan fish -- to a full-sized 9-inch blade for that fish you've only imagined. The construction is simple and not quite foolproof. Depress the locking lever in the back of the handle to lift the locking pin from the slot cut in the spine of the blade. Carefully adjust the blade length by manually shifting it in or out of the hard plastic handle. Make sure the locking pin seats solidly in the blade notch before resuming work. Effectiveness will depend very much on the care you give this interesting knife. If you let filth accumulate in the handle, the lock won't be as reliable, and this style of construction will definitely take more time to clean than a fixed blade with solid components. The size and effectiveness of this new grip also doesn't quite match the Kershaw fixed blade solution, but considering the versatility of this knife, it's an acceptable trade-off. The Kershaw Seven Step comes with a hard plastic ABS belt sheath built to hold the knife at its minimum length of 10-1/4 inches. See the Dexter Russell Fillet Knife for a simple fixed blade style that's easier to clean.